Announcing the release of Twitterrific 4.3 for iOS and Macintosh. This latest update to our popular Twitter app includes support for syncing reading position in the timeline across all platforms, improved scrolling in Lion, viewing Camera+ images inline and a host of additional improvements and bug fixes. Version 4.3’s best feature is the ability to sync your reading position across all versions of Twitterrific by using the Tweet Marker API. Twitterrific keeps track of where you are in the timeline and displays that position as a bookmark on the tweet’s timestamp. Twitterrific can also automatically scroll to this position – no more searching for where you last left off. This makes reading your timeline a breeze when moving between Mac and iOS during the course of a day. Turn on timeline syncing via Twitterrific’s settings. Twitterrific 4.3 is available as both a universal app for iPad, iPhone and iPod Touch, as well as for the Mac desktop via the iOS and Mac App Stores. The software is free of charge for use with a single Twitter account. Users can upgrade in-app to remove advertising and enable multiple Twitter accounts. To help mark the release of version 4.3, we’re offering a special 50% discount for the Mac version of Twitterrific in the Mac App Store. If you’ve been on the wire about Twitterrific for Mac, now’s the time to take flight. 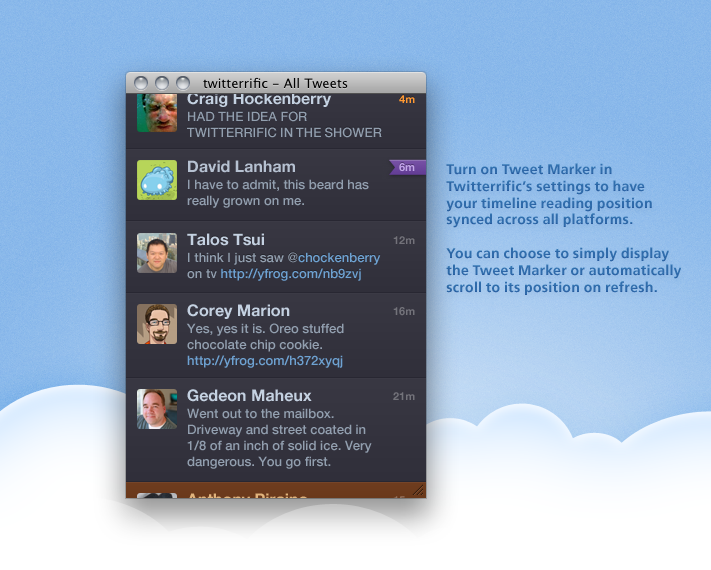 Twitterrific is available from the Mac App Store for just $4.99 for a limited time.